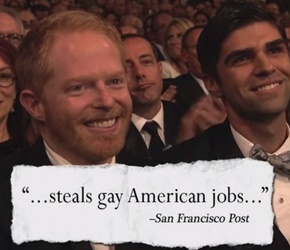 'Modern Family' star Jesse Tyler Ferguson is starting his Emmy campaign for 2013 early and he's going negative. Jesse and Eric Stonestreet may play a loving couple on "Modern Family," but Sunday night's Emmy awards pitted to the two actors against each other. They were both up for the "Best Supporting Actor in a Comedy Series" award, and when Stonestreet was named the victor, the claws came out. Jesse stopped by "Jimmy Kimmel Live!" and premiered a little attack ad to help set the record straight.